"Second, we very carefully study a cartoonist’s writing ability. Good writing helps weak art, better than good art helps weak writing." As someone who is constantly looking at, thinking about and creating comics, I can tell you that this is total bunk. While it's true that the foundation of a comic is often (but not always) the writing, and the drawing doesn't have to be realistic or beautiful, terrible drawing — or drawing that just doesn't work with the writing — can kill a comic just as thoroughly as a poorly turned phrase. Saying that writing is more important than drawing in comics is like saying that writing is more important than performance in stand-up comedy. This just isn't true. Go to some open-mics and you'll quickly see that a beautifully crafted joke can easily be killed by terrible delivery, and vice-versa. In comics, the drawing is like the performance of a stand-up comedian. It can enhance, detract or add nothing to the writing. Working on a recent Malcontent I was again reminded how a drawing can make or break a comic. Malcontent brand webcomics almost always begin with writing. Usually two or three lines of text, but sometimes only one. These one-sentence Malcontents can be the hardest to draw. The drawing has to add something to the writing or the whole thing tends to flop. Often I'm lazy about it and rely on the facial expression of my protagonist to convey the idea and, thus, some of the humor. But the best one-liners are the ones where the drawing adds a new dimension to the idea set forth in the written text. 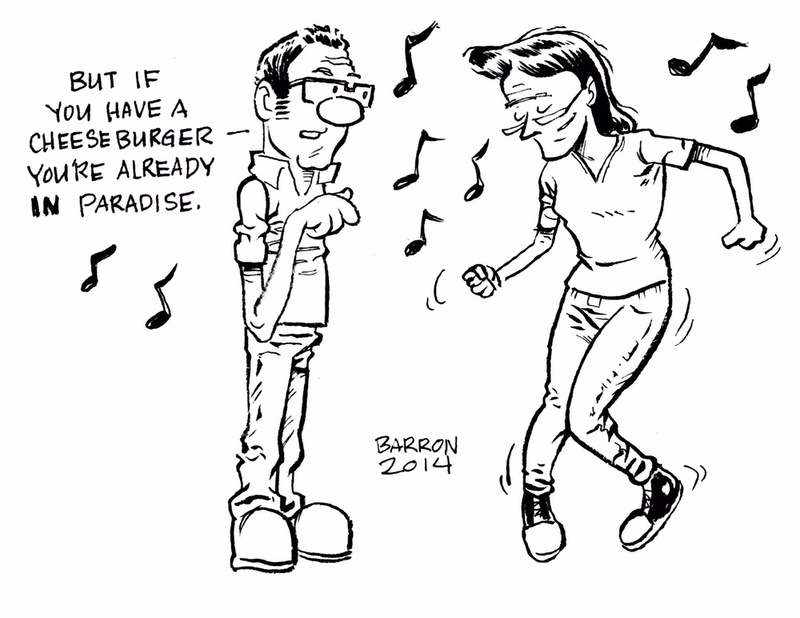 "But if you have a cheeseburger you're already in paradise." Here you can see that the drawing just kills the joke. It's static and has no attitude whatsoever. It merely illustrates the most basic elements of the scene: a guy listening to the radio. There's nothing inherently funny about that scene; there's nothing inherently funny about the drawing. There's no emotion to this drawing, no perspective. It's just observation. It's flat. It's decidedly unfunny. This is much better for a bunch of reasons. First of all, there's movement, it's kinetic, it's fun to look at. Secondly, the drawing is funny: the dancing figure in contrast with the static one is a good visual gag. Also, the scene is funnier: this is a scene of two people dancing, but one has stopped to make an observation, which creates tension and drama lacking in the earlier image. But most importantly, this drawing adds something to the humor, to the story, to the whole of the piece. It adds another dimension. Now it's not just a funny line, but it's about a character. This character can't enjoy himself because he gets too wrapped up in minutia. It speaks to the relationship between these characters as well. While he gets bogged down by details, she happily keeps dancing along. She doesn't let him get her down. This drawing does something for the comic, where the other did nothing. And that's what I would like to strive for in every comic. I often fail at this. But it really helps to try and come up with multiple takes on a comic idea, rather than settling on the first one. But the fact remains: drawing and writing in comics are equal partners, each complimenting the other. When either element is off, the comic tends to suffer or even fail; but when both are on it's a thing of beauty. Today I accomplished something I've wanted to do for a very long time. Today I submitted a family-friendly version of Malcontent — called The Malcontents — to two syndicates. Putting together the syndicate package has been a lot of work, but I've enjoyed the process immensely and I think it's driven me to produce some of my best work yet. I've worked really hard on character development, storytelling, joke writing and, of course, my drawing. I think it's all gotten a lot better, though there's still tons of room for improvement. Since developing The Malcontents I've started thinking more in stories, and come what may, I plan to use these stories in the future, whether that future involves syndication or not. Which is just to say that, if The Malcontents doesn't get picked up, I'll be using it in the webcomic in the future, as a part of the Malcontent universe. In the meantime, I wait. It can be several months before you hear from a syndicate regarding your submission. Until I get a response, I don't want to reveal this work — I might need it for my big syndication deal, after all. In fact I'm sitting on a bunch of ideas, on the off chance I get a deal. But let's be realistic. Getting syndicated is about as likely as winning the lottery (though it's a lot harder to play). I have no illusions about my chances. They are close to zero. And I'm okay with that. In fact, I'm pretty jazzed. Because today I accomplished a major goal, one I've been working towards for months, and one I've always wanted to try. And I have some great experiences and new ideas to show for it. Even if I don't get syndicated — and it's almost certain I won't — it's all very, very good. In Malcontent, Musings Tags syndication, bears!